Radio has been the most popular form of media in Afghanistan since the 1920s, which is mostly in Dari (Persian) and Pashto languages. There are an estimated 150 radio stations broadcasting throughout Afghanistan. Radio broadcasting went into air in 1925 with Radio Kabul being the first station in the country. By the late 1970s, nearly all homes owned a radio, especially in the major cities. 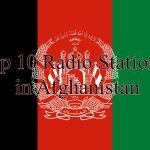 An estimated 150 radio stations exist in Afghanistan, with AM, FM and shortwave, broadcasting mainly in Persian and Pashto as well as some Urdu, Hindi and English languages.